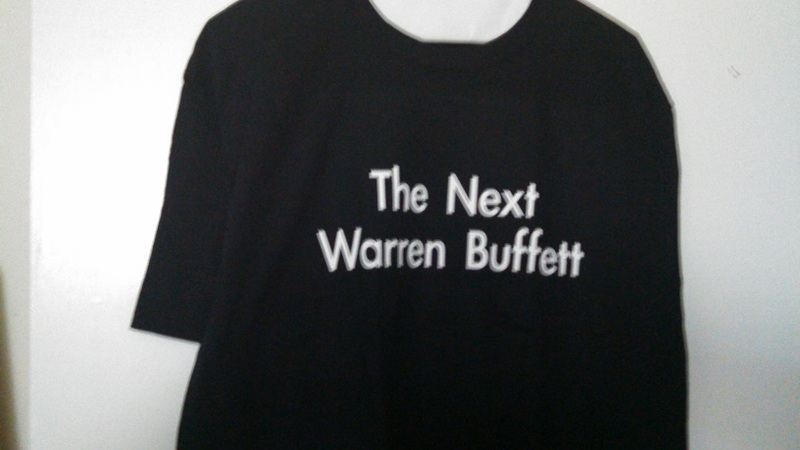 Back from the Warren Buffett Convention! You’ll never guess where I’ve been. 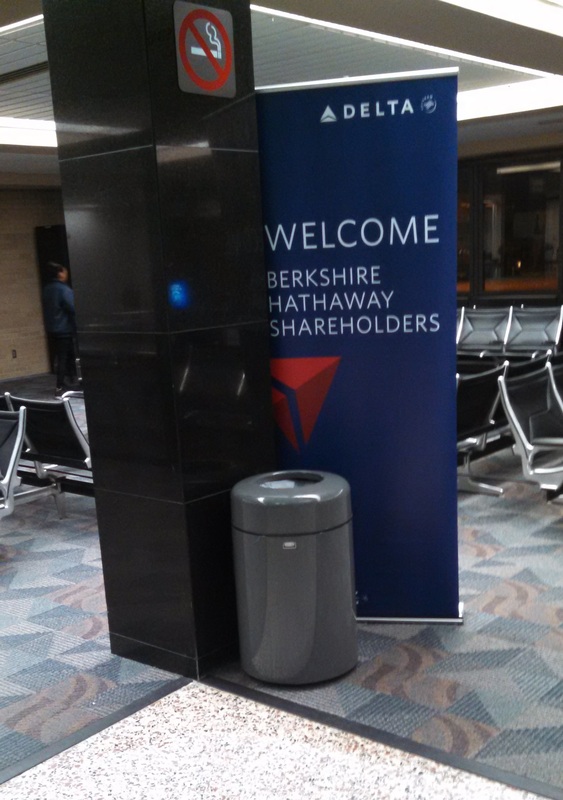 Yes, the Berkshire Hathaway annual shareholders’ meeting in Omaha. And here’s how it went. The meat of the meeting occurs on Saturday, where Warren Buffett and his co-chairman, Charlie Munger, spend hours fielding questions from the financial press and from lucky audience members. I would have asked, but most naturally my questions would run dangerously close to the forbidden topic of what Berkshire is buying. All other topics are fair game. The doors to the CenturyLink convention center in Omaha opened at a nice jet-laggy 7 A.M., which was about the time my group of three arrived at the end of the line, and we still barely managed to find adjacent seats. 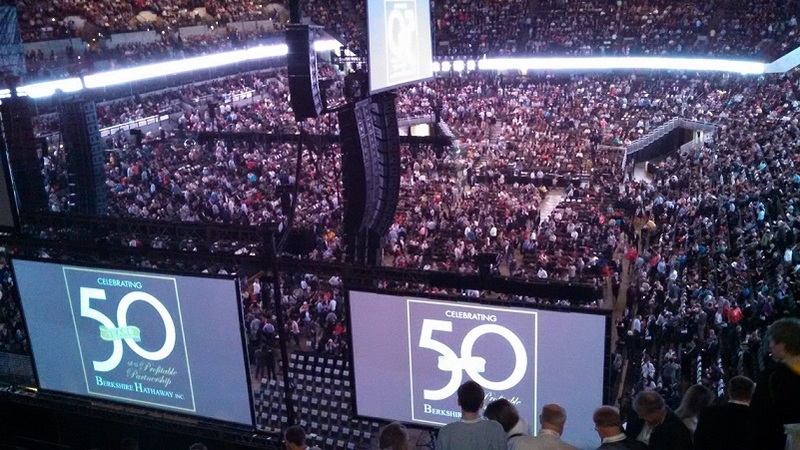 The crowd of about 40,000 was a record, and even though there were overflow rooms in the hotel near the center, it still seemed as if the shareholders’ meeting has become bigger than Omaha. At the very least, some manner of assigned seating would probably be in order in future meetings. The first question invited Berkshire Hathaway to respond to a critical article about the allegedly predatory practices of Berkshire’s prefabricated housing subsidiary, Clayton Homes, and also its strategic partnership with well-known takeover artist and heartless downsizer, 3G Capital. As for the first charge, Buffett replied that the prefabricated homes market tends to target the lower end of the credit spectrum anyway, that its profit margins were not in fact out of line with the rest of the market, and that the company was not an aggressive securitizer and so it actually suffered when its customers went broke. As for the downsizing argument, Mr. Buffett made the point that Berkshire Hathaway has never suggested that a company should intentionally overstaff itself and that Berkshire Hathaway would just as happily shed its useless employees if it knew that it had any. In my view this sidestepped the question of whether 3G and Berkshire have different definitions of useless, but more importantly, because of the slides he had to support the defense of Clayton Homes, he had to explain after lunch than the firm was sticking with the tradition of not getting the questions in advance; it just happened that he was expecting that question and came prepared. I’m not going to go through all the questions, but there were a few highlights. One question was whether, in this time of diabetes and healthy diets, Coke would retain its popularity. Warren and Charlie pointedly took a piece of from their box of See’s peanut brittle, and replied that Coke’s value came from its unassailable brand, and that Warren personally derived about a fourth of his caloric intake from sugar and that, in all fairness, the people shopping at Whole Foods are usually not smiling. I agree that in general a strong brand offers pricing power, which offers protection against competition and some adverse future developments, and it never hurts to be assured of being a larger piece of a smaller market. On the topic of the current high levels of market valuation, he was asked if we should be worried that the total US market cap/GDP ratio was 1.25x, a level last reached in 1999, and that corporate profits/GDP was 10.5%, whereas its historical range was 4-6.5%. He said the second one is a thorny problem of income distribution that goes beyond stock multiples, and the first one is a predictable consequence of low interest rates. In his response to another question along these lines, the two chairmen did express surprise that all the government intervention since 2007 has not resulted in inflation, but in face it does, a lot of Berkshire Hathaway’s subsidiaries are capable of keeping up with inflation, although the company’s $60 billion in cash reserves might start to look better if they were invested in something. The issue of tax reform came up, and Mr. Buffett expressed his optimism that Senators Hatch and Wyden would be able to come up with a deal that addresses the high corporate tax rates and the issue of offshoring. Mr. Munger added his complaint about California’s unusually high state capital gains tax rate, which he said was chasing rich people away. This comment drew a great deal of applause. Of course, an audience of Berkshire Hathaway shareholders is not going to be receptive to the idea that their taxes are too darn low, but someone with Charlie Munger’s intelligence must be aware that the problem with California’s tax system is Proposition 13, which caps the annual growth of property taxes at a rate that has until recently been below the rate of inflation, a problem that accumulates exponentially over the years and which is also in my view the problem with California’s public education system. Warren Buffett did circle back by saying that if the federal government is going to spend 20% of its GDP, which it has roughly done for the last several decades, then it has to raise about 19% of the GDP in taxes, one way or another, with the extra 1% capable of coming from economic growth. As with many statements from Warren Buffett, this one is simple and broadly uncontroversial math, but has the rare quality of being expressed in one clear sentence. As for insurance, Berkshire Hathaway’s favorite division, Buffett was asked if Berkshire’s phenomenal performance in this sector could be repeated. He did cite three lucky turns in his life, two of which were acquisitions and the third, which came before either of them, was finding a mentor in the insurance industry who taught him the secret that in the time between when an insurance company collects a premium and when it pays a claim, the money is the insurance company’s to play with, a practice that has served Berkshire Hathaway incredibly well over the years. In response to another question, about reinsurance, Warren Buffett replied that the reinsurance market was overpopulated wiht capital at the moment because some silly person reminded the world’s portfolio managers that natural disasters are not correlated with the stock market and the general economy, and in the mainstream financial world “not correlated” is more important than “not unprofitable.” Probably a useful thing to remember when examining reinsurers generally. Another key point was the question of share repurchases, which came up in a tangent in a response about how to deal with activist investors (the secret, unsurprisingly, is to run your company so well that there is nothing for them to do and have no tax-efficient breakup value either). Warren Buffett answered that most companies engage in share repurchases at the worst times, when a company’s shares are overpriced. But he might have revealed more than he intended when he added that he would consider repurchasing Berkshire Hathaway at 120% of book, but certainly not 200% of book. This range might be too wide to trade, considering Berkshire Hathaway’s price/book ratio of 140%, but if the price moves towards either of those extremes the alert investor can trade accordingly. Still, despite the early hour I did greatly enjoy the shareholder meeting experience, and I even picked up a souvenir T-shirt at the trade floor downstairs. Not that I’ve ever been accused of false modesty, of course.